First – we won the ‘largest competing sporting group’ category. We did it!! This well organised ’whole of family’ annual event is generously put on by the City of Cockburn. 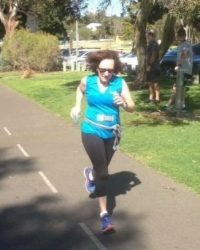 It is totally FREE to take part in, and participants can run, jog, walk or skip the 6km footpath around Bibra Lake. It’s not far for Y Striders! Easy-peasy! From the moment we stepped out of the car on this picture perfect day, we were struck by the tranquillity of the place! The full lake a sparkling mirror with swans gliding by, the green, well maintained parklands and, the shady, picturesque pathways! It made us glad that we had made the effort to get out of bed and take part. We can thank Eva and Kerrie for motivating no less than 19 people to register for the run. 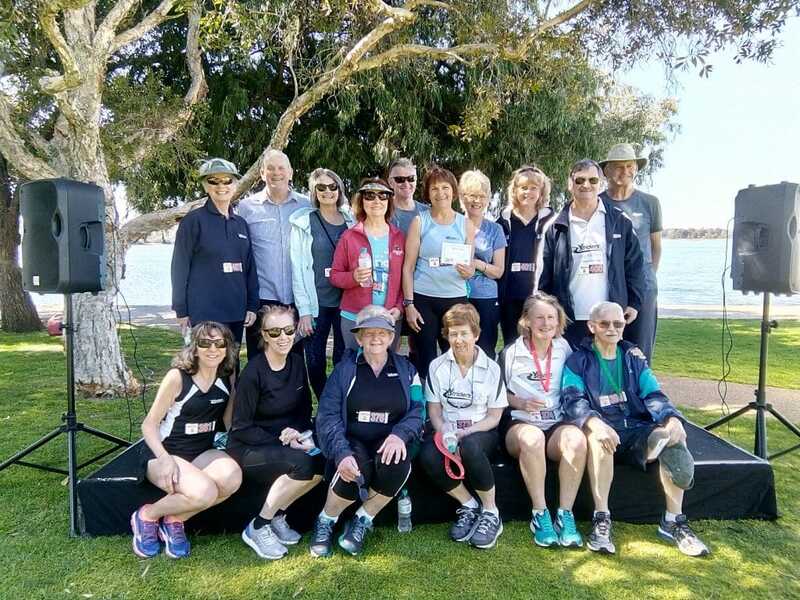 As a result of their motivation our club won the largest competing sport club category – a $250 voucher to spend in a sport shop. Fantastic effort Eva and Kerrie! And then there was Kokoda Kerrie! She ran her own race, coming second in her own category but there she was, cheering and encouraging everyone else across the line! She even thwarted Darryl’s efforts at trying to beat Elizabeth and Christine H across the line by warning them of his intentions to do so. There was no way the girls would allow that!! Bad luck Darryl………. And what about the canny Scot! 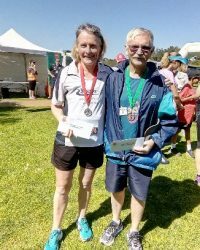 Martin quietly went about his business and effortlessly picked up a third in the over 55 category – yet another medal to add to his collection. But it didn’t finish there. Joanne and Mark invited all of the Y Striders back to their nearby house for tea, coffee, refreshments and debrief over the morning’s events. Wow! What can I say? It was a spread fit for a king, complete with homemade sausage rolls, cheesecake, almond raspberry cake, curry eggs, fruit platter and an assortment of slices. Thank you Joanne and Mark! We easily fitted into your large entertaining area – with room to spare. 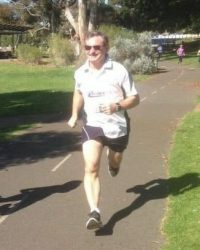 We missed Bill’s presence at the run! We understand he was indisposed but then perhaps he is saving himself for Bunbury? Get well soon Bill.